You are here: HomenextPeoplenextLocal folknextVictor Richardson M.C. The grave of Victor Richardson M.C. I am currently researching the life of Hove officer Lieutenant Victor Richardson, who died of wounds incurred at the battle of Arras, on 9th June 1917. Most remembered as ’Victor’ or ’Tah’ from Vera Brittain’s ’Testament of Youth’ and ’Chronicle of Youth’, whose correspondence is also featured in ‘First World War Letters of Vera Brittain and Four Friends- Letters From A Lost Generation’. Victor was born in Hove on 18th March 1895. He was a member of the OTC at Uppingham school and was intending to study medicine at Emmanuel College Cambridge when the Great War broke out. Instead he volunteered for service, joining the 4th Battalion, Royal Sussex Regiment. However Victor was struck in January 1915 by a severe bout of meningitis, contracted at the Horsham army camp, and it was not until October 1916 that he was fit to serve on the Western Front. He became attached to the 9th Kings Royal Riffle Corp and fought at the battle of Arras on 9th April 1917. He was wounded in the arm, reported for medical treatment then returned to the fighting, only to be shot in the head which caused him to lose his sight. Victor was returned to Britain and whilst being treated at the 2nd London General Hospital, began to suffer from delirium. He died on 9th June 1917. 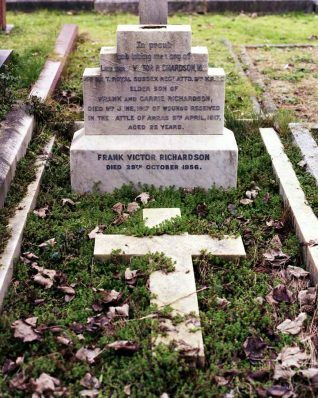 Victor was buried in his mother’s grave, at the Hove Old Shoreham Road Cemetery. Myself and a number of other individuals with an interest in the Great War are concerned at the current state of the grave. Discussions to this effect have been taken place on the WWW based ‘Great War Forum’. More details concerning Victor’s life and upbringing in Hove can be found in a new book titled ‘None That Go Return- Leighton, Brittain and Friends and the Lost Generation of 1914- 1918’ by Don Farr, Helion and Company, 2010. Restoration work on Victor Richardson’s grave has now been going on during this Spring (2012). If anybody is interested in a further update, please E mail me at Infernus9@aol.com – please put ‘Victor Richardson’ in the subject heading.